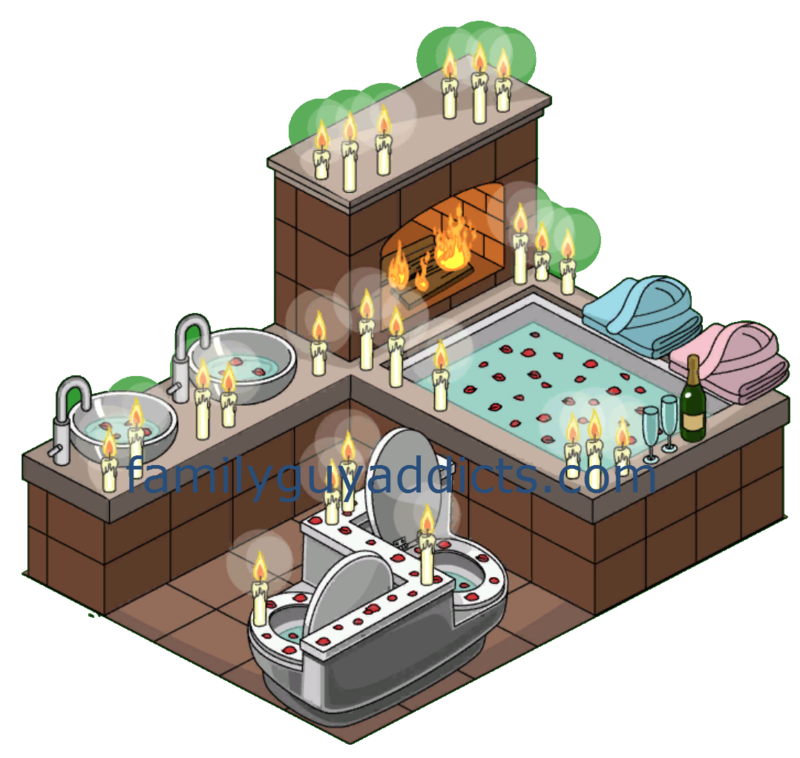 ← Quahog Valentine’s Day Walkthroughs: Phase 2, My Funny Valentine, Glenda, Cheryl & more! Trying to figure out just what all these “Prizes” are for that you get awarded for sending Characters on the correct Date? Keep on reading below to see a more detailed breakdown of each one. There are a TON of Date options for Characters in the game (see links at bottom of this post). Some even award you cool prizes. But just what are all these prizes and what do they do? Let’s take a peak. Fire Hazard Bed (Decoration): Sits on a 4×4 base. Not currently animated. The detail on the candles do give the impression that they are almost flickering though. Adds to an outdoor “Bedroom” themed area. Lol. Brewhaha Carnival Ride (Building): Sits on a 6×6 base. Pays out 8 Homemade Valentine’s and 15XP every 4hrs. Not currently animated. Looks really cool in a theme park kinda area. Ultimate Couple’s Bathroom (Decoration): Sits on a 3×4 base. Not currently animated. The detail on the candles do give the impression that they are almost flickering though. Also could add to an outdoor “Bedroom” themed area. Lol. 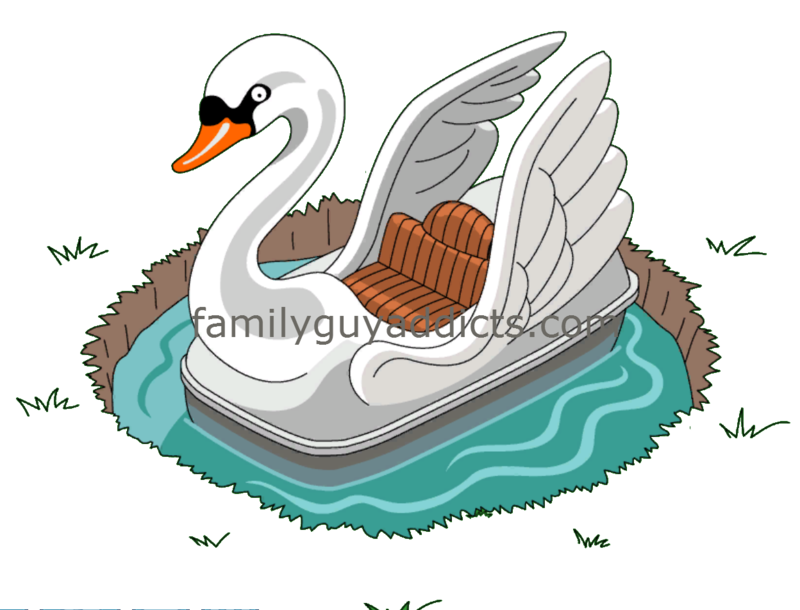 Goosey Gondola (Decoration): Sits on a 5×5 base. Not currently animated. It blends right into the grass around it. Would look cool in a regular park area or a Theme park area. Lady Moonshine (Moving Decoration): This is similar to the other Moving Decorations like Meg’s Car, Mall Santa’s, and the T-Rex. 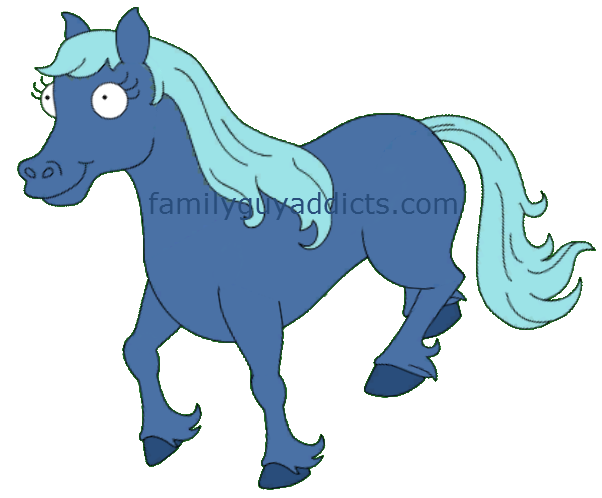 The Horse will walk your sidewalks around Quahog. When tapped the horse does make a quiet neighing sound and also stands on it’s hind legs while kicking the front ones. Lovely Greenhouse (Building): Sits on a 6×6 base. Pays out 10 Homemade Valentine’s & 30 XP every 8hrs. If you look closely, you can see flowers from past events were used to decorate around it. Looks cool if you have more of them that you can create an entire Flower Garden area. 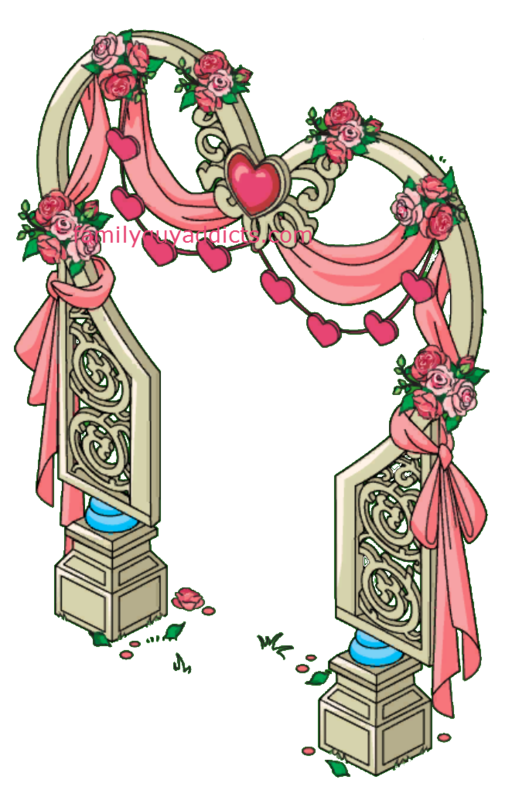 Lovey Dovey Arches (Decoration): Sits on a 1×3 base. Not currently animated. 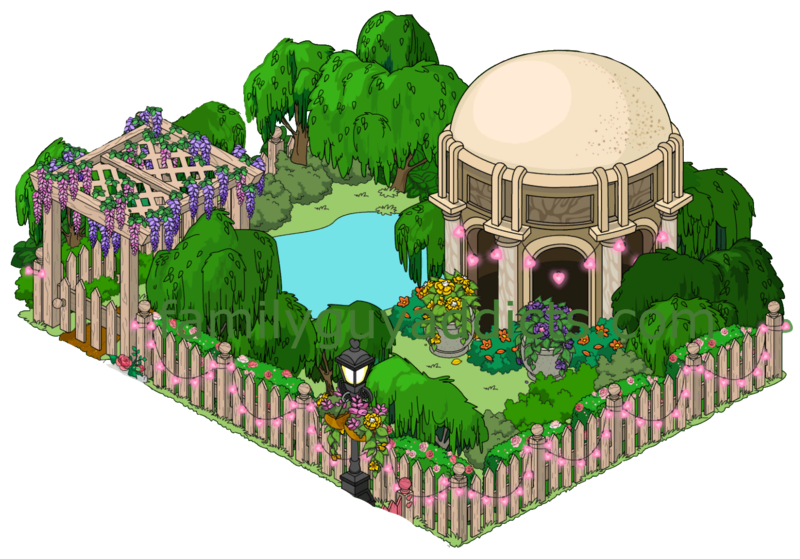 Would look cool in a Wedding themed area or a Love Park Setting. For a complete list of the dates for each location, see the Morning Arousal Coffee post and the Romantic Thoroughfare post. For a complete guide on just how to do this all, see the How To Date post. There you have it. Some fun new items you can get just for sending Characters on a Date at one of the two locations. What do you think of these extra Prizes? Have you got any of these prizes yet? Do you have a favorite one? Let us know. 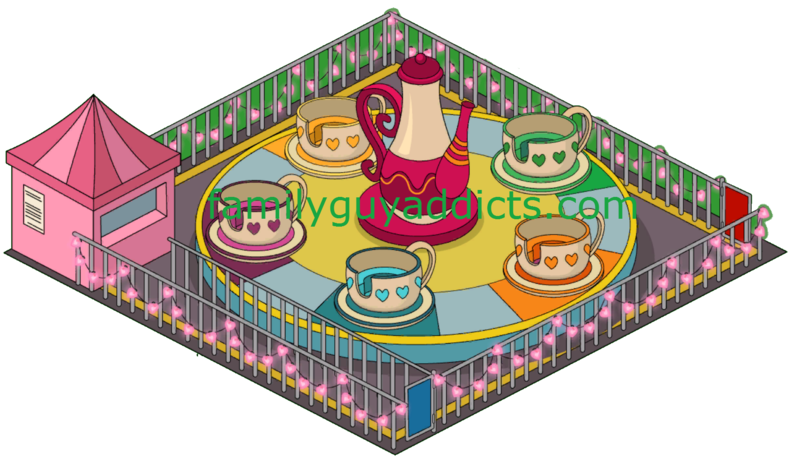 This entry was posted in Game Play and tagged Brewhaha Carnival Ride, Family Guy Addicts The Quest For Stuff, Family Guy Tips and Tricks, Fire Hazard Bed, Goosey Gondola, Lady Moonshine, Lovely Greenhouse, Lovey Dovey Arches, Romancing the Clam Event, Ultimate Couple's Bathroom. Bookmark the permalink. Peter & Lois have been at least three to four times now on a date, but still no Fire Hazard bed, only more hearts? The game has also been kinda slow and crashed down occasionally so can it just be lost forever? 😦 Thanks for answering. You sure it is no where in your town or in your Inventory already? They are in no order there. Just random. I had to scroll by 6 times before realizing where it was in there. Just wondering if there was a list for movie dates? Thank you for this date list. It really helps on trying to figure out what i want to go for. On a side note….. I would of loved to have come to the meet and greet but alas its not to be. The Mrs. And I have a 9 year old and we would of loved to come and meet you all, but the age restriction is kind of a bummer. But thanks for the great sites and jobs you do on keeping us informed. Only a couple of my guys are able to go on dates? Most of my town doesn’t show up in the selection is there a reason for this? 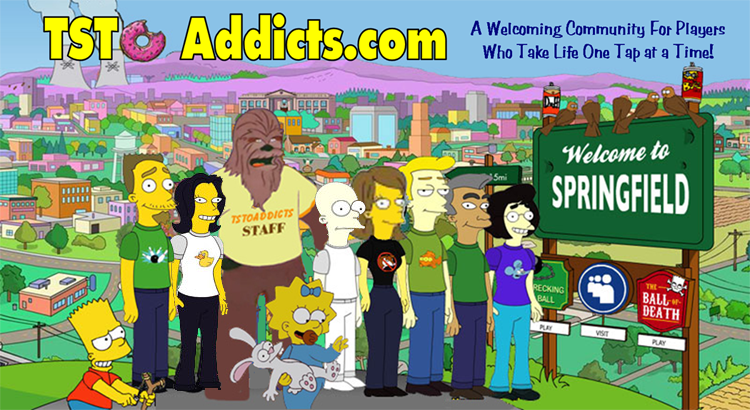 Some characters are only available in one location, so it depends on WHERE you are trying to send them. Also, if they are on a task currently… the are not available to send on another task so wont show up in the dating icons until they are Free to do so. Can’t place brewhaha carnival ride keeps crashing my game any suggestions and is this a known issue? Yours is first I saw. I was able to place it fine in my games. Try some basic troubleshooting and if that dont work, reach out to them. Would really love it if TinyCo would fix this bug about Lois if you have Nerd Squatters. I’m not able to clear them because I just opened the area right before the event started and despite my frantic actions to gain the items to unlock Stewie or Falconeer Peter, I can’t get to the point to clear need squatters. Now I can’t send Lois on a date with Peter which means I can’t get the Fire Hazzard Bed. TinyCo’s response was “we’re working on,” but that’s what they said months ago when the American Dad event ended and I hadn’t unlocked Steve and he just sits there in limbo unable to be unlocked. I doubt they will fix the bug and players like me are stuck without being able to take advantage of the full event. Instead of working on new events, how about we fix the existing bugs first. Don’t stress on it. They are aware of the issue and will find a way around it. Lois does not have the option of going on a date. I’ve searched through all her costumes and none of them allow her to go on a date. I would love to get the Fire Hazard Bed but I can’t. There is a bug with District and the squatters that will interfere with the event. Due to this, if you are in that District… her option to date is disabled. They are working on a way around the issue. Just hang in there. If you buy the Garden, you get a version of it once event is over. Is cheryl timed? I am almost finished repairing her bench. Any update on items for Cheryl? I got a fan with Nathan and Felicia, but I really need the swimsuits and violins. Any pairing give those? The romantic throughfare doesn’t stay or anything, right? We’re just paying to fix it to use it for the event? You’ll get a version for your town once the event is over…if you spend the 200 clams. Do any dating combinations drop items that you need for Cheryl? Also, Nathan Fillion and Felicia Day drop fans for Cheryl when you send them for a romantic walk. I watched the episode last night as well, next Halloween event they should do the ghosts of everyone who died, Stephanie, Muriel, James woods and Juillian’s boyfriend and James woods’ wife. I got the box set and I’m watching one episode every night. love it. Sorry this isn’t a question about the post but for the last few days, if I go to Ollieland, the game doesn’t acknowledge that I went three after a few hours. I lose my money or clam and I have a notification on the screen to go back and visit it. A couple of the times my actions aren’t there either. I have to go back to have a character complete an action that I just had them complete or they are wondering around town because they never acknowledged that I told them to do something. Hmmmm very odd. Try some basic troubleshooting and if it does not help, contact them about it. Any idea if you are able to earn a 2nd asylum and if it will be beneficial? I have the one I earned during the previous event and I don’t know if I should go for the one in game or the Cupid statue. I really don’t want to lose out like I’d did on the liquor store bumper car thing (still hurt i didn’t get the liquor store!) any idea how many love/hate hearts are needed for the prize? If the Cupid statue is just a deco I won’t feel left out. I am thinking maybe the asylum will pay out hate hearts but….I think I want hot Meg so I would want love hearts! 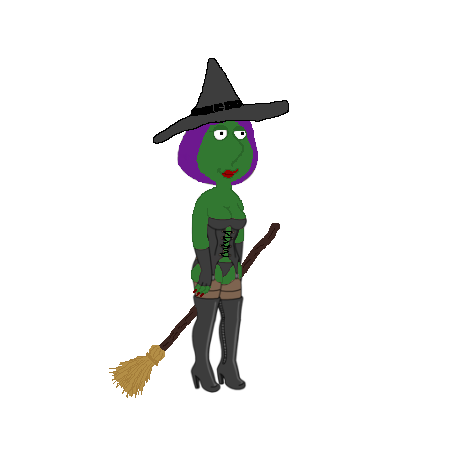 Any info on the voodoo shop so I can see if I should choose that instead of a new skin for Meg? Idk idk so much to think about when you aren’t given specifics about the prizes! They only show the icons of upcoming due to player request so you would know where the Prizes are. The items don’t actually “exist” in the game yet, so until they’re are live and active…it’s impossible to say what they do. It’s all only speculation til they actually go live. I thought I would lose out on the Liquor store, as I had over 100 Love Hearts at the time the prize rolled out. But, they dropped me back to 74 Love Hearts due to a programming bug, and I chose to make a run at Hate Hearts and earned the Liquor Store! It took 149 Hate Hearts in total to get back to the 75 required, but got what I wanted and didn’t have to settle for the Bumper Cars.